Still thou art blest, compare'd wi' me! This 1785 poem provided a relevant framework for a discussion of gentrification and dominion and left us wondering if Burns the poet was mocking the plough-wielding speaker or if Burns was the speaker in ernest. Did he actually just say that because his prospects are so dreary that the mouse should not mourn her own homelessness? We considered the theme of being small and powerless in the path of the progress juggernaut - especially as it relates to real estate developers and our own housing - a highly relevant concern for artists in San Francisco. With this in mind we set off to the old Bethlehem Steel Factory at the waterfront to visit the site of a now defunct industry and focus on making site specific art. A 1796 edition of the collected Burns' poems. 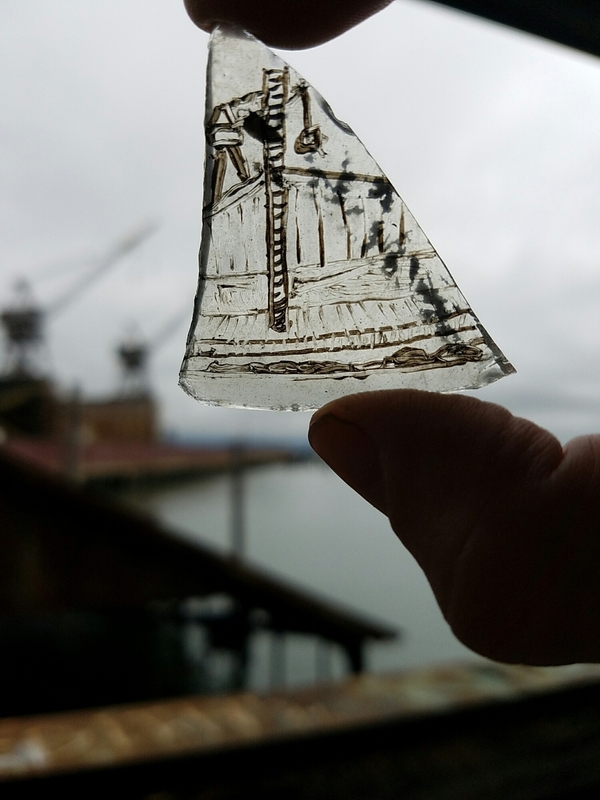 A quick sketch on found glass of the view out the warehouse. Lexie looks out the torn warehouse wall. The view out the torn warehouse - it sits directly on the water. In the end, everyone was so taken with exploring the abandoned buildings and docks that it was decided we would return later with cameras and a plan for working on a series inspired by the space.